Residents of Dunlavin may have been surprised to see the Spanish flag flying and hearing Spanish accents around the town this week. 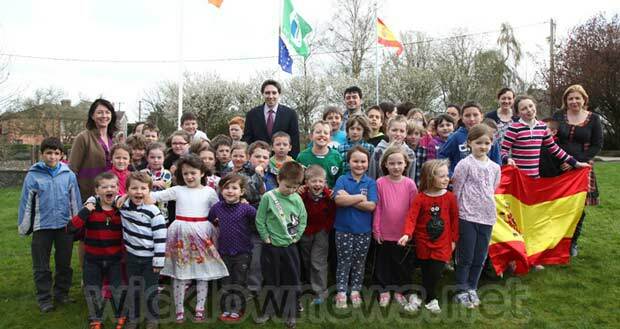 Simon Harris TD visiting Jonathan Swift National School earluier this week. 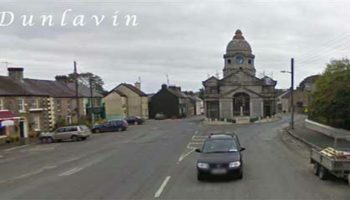 A group of 13 (9 children, 2 teachers and 2 parents) are staying with host families in Dunlavin for a week and attending school at the local Jonathan Swift National School. Their school in Milagros (1 hour north of Madrid) is twinned with Jonathan Swift . This endeavour is to maintain and enhance the teaching of Spanish in the National School, to swap educational projects online and to give opportunities to travel to learn. A group from Dunlavin hope to make a return visit to Milagros in early October. 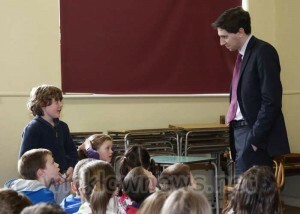 Simon Harris TD is a candidate in the upcoming European Parliament elections and visited the School this week to meet the Spanish visitors and hold a discussion with the pupils on the European Institutions. He answered questions on a range of topics from the location of the European Parliament to queries if the European Parliament ever robbed ideas from the Irish government! Joe and Sarah O’ Flynn are holding a farewell reception on Friday evening for the Spanish visitors and host families. The group will visit Dublin on Saturday and travel home on Sunday.